Without a shadow of a doubt, this year has been shocking. Dire weather, has robbed many of us of a decent crop and enjoyable growing season. It would be easy now, to throw the trowel in. Yes, trowel. But then perhaps, we won’t have learned anything. There is no man, woman, or gerbil for that matter, who can tame the elements. I firmly believe, that whilst weather conditions can be challenging, their effects devastating, there is always a way of making things happen in the horticultural sense. Plot 2a has spent more time wet and windy, that it has cultivated and cropping. Though, there was a hearty crop of weeds and slugs, these are not the sort of crop I envisaged. You can’t eat slugs, for a start. I mean, would you want to? It may all have been a wet wash. And I may have nearly gone bottom over top some times in the clay. But the potential still stands. The seed stashers are sat on the side. Yogurt pots have been retrieved from Dad’s shed. All in eager anticipation. Each and every seed is a pocket of potential; and all seeds want to grow. All seeds can come off….all right, parsnips would argue the toss. But you know what I mean! Seed potatos have been ordered. Though that won’t stop me from going to the Potato Day at Ryton. I went last year, and bought a hand full of King Edward Potatos.They all got rained on and eaten by slugs and the clay, but they were sunk. Spring garlic and onions have also been ordered. I want some more of these, and I don’t think those planted in October will have survived the winter deluge. So I am adopting a Robert the Bruce and Spidey approach. Trying again. Simples. Wishing The Dirty Shovel club, the very best for 2013. If you find you gave a glut of peas, cabbages and don’t know what to do with the leaves of a cauliflower. Here’s an idea. Kofta’s are basically a veggie version of a meatball. Bollywood masala tin: garam masala, cayenne, salt. Dash of worcestershire sauce and an oxo cube. Mixed herbs will do the job too. Mix your kofta material with gram flour and water. You want a sludgy mix, sticky but not sloppy. You can make the mix more solid with additional gram flour. Should look a lot like chunky *humous. Add salt, pepper, cayenne for taste. Not too much salt. Else you’ll end up with slushing was that won’t hold it’s own. If you want a bit of tang and crunch, add black salt and some crushed up *cooked chickpeas. Fry these off and they should go golden like scotch eggs. Leave aside till later. Fry off the garlic, ginger, cumin, onions till golden and mushy and paste like. Should have blitzed these too in a blender. Add tomatoes, with the contents of of spice box and chillies. Don’t forget your Worcestershire sauce and mixed herbs. If you are adding spuds and peas do so now. Watch your spuds, to cook through properly. Shouldn’t end up mushy at the end. Add liquid, with oxo cube. You should now be looking at a broth. Let this simmer, infuse for a good half hour forty minutes. Must no go dry. Drop your koftas in. With any luck, they won’t fall apart and go mushy. Ta-da! You have summat to eat. The plot is wonky, in the lowest bit of the plot, and therein liable to become a pond. The clay, could probably be well worked by a potter; for all it’s nutritional value, it has given me a headache. The remedy, or means to make it practical. Raised beds. This summer, the boon of online sales of the gardening sales, led to raised beds being purchased. These were addition to the one, bought last autumn. The reason why, was that Mama H nearly clambered into the claggy, heavy clay, and then very nearly couldn’t come back out again. She had sunk nearly a couple of feet. This would not do! Especially, as part of the remit of having a half plot is that there would be indian food grown there. This in the most generic sense, involves Spinach of the Indian variety. I don’t what Indian Spinach is specifically. Only that red cardinal leaves really don’t cut it. So to keep Mama H safe, and to have a productive plot, the raised beds are warranted. There are 12 beds in total. The vary between 1m x 1m and 2m x 1m. All were delivered, swiftly by an online shop. All were straight forwards in their construction. The only issues, blisters, and pops making some of them. I was more than happy to construct them! Alas, pops didn’t want them cluttering his garage, and before I got around to them. He took a screwdriver to the last one. I had managed to construct three, and fully anticipated the fourth one. The four smaller ones, I did construct. However, Pops being Pops, had to reinforce them before they were taken the 80 yards down to the plot. There was blisters, I might add. Though that was not me being a bit feeble. I attribute that to the screwdriver. An old one that belongs to Pops, that has been around since the arc. No good using the newer one, it didn’t feel right. Once constructed, these were placed on the plot on top of newspaper. As it stands, and the water does-badoom, crash-the beds are filled with leaf mold. This is most likely going to sink over time as it decays. The plan,or half plan rather, is to fill these with compost. There is the poop that Pops shovelled to also put into them. …yes, sling it. Go away, you’ve done quite enough damage, muchas gracias. It has been a turbulent year on Plot 2a. With the exception of garlic, over wintering onions and shallots, the only horticultural cultivation has been that of malevolent weeds and ankle deep puddles. You could argue, that perhaps I didn’t pay attention to various bits and pieces, that the weather played havoc-my money is on this one-or that I really should have listened to various plot neighbours and moved else where. I am standing by the bad weather. There was much hope for this year. Only for most hope to be dashed. There is no time now to wallow. Though, given the puddles, that would be the fairly easy option. Clay, is very good apparently, full of all sorts of goodies. It most certainly was, it sustained and nourished all those weeds during the Olympics and Jubilee Celebrations. If one things has been understood this year, then it is not to make concrete plans. Listen, perhaps to the elements, and declare war on slugs. We speak not of small, singular slugs. Oh, no, we speak of fairly sizeable, abnormally large slugs in their masses. It is a case of growing and propagating and nurturing slugs. Beer traps, have failed. Broken ceramic tiles, have failed. Blue pellets, have failed. There is only so much slug lobbing that you can do. Slugs, however, are a mother nature bug bear.Managed perhaps, and tolerated. Just impossible to complete obliterate. So, we have a damp, dreary, depressing plot 2a. A bit of a muddy canvas. A muddy canvas, that is going to require a bit of thinking about really. There are raised beds, which should help. What remains to be seen, is whether any of the over wintering things have survived. There are a stack of GYO books, a veggie growing planner, copies of a GYO magazine sat for perusal and reference. With the misplaced jet stream, this year has been somewhat of a torrid affair. Nothing, has quite come off. It is all well and good making plans. Above, you can see the paper and ink plan of what went where. The wendy house, as you’ve already gathered is a shadow if it’s former self. It is an ex-wendy house, it has more or less ceased to exist. In the most simplest sense, the plan does say what went where. I think I drew this about eight weeks ago, I was still feeling buoyed that the there was possibility of the over wintering garlic, onion and shallots coming off. Now, I do hope that you have enjoyed the festivities. There is always a great deal of anticipation, a chance to rest, reflect, harvest your Christmas dinner. Alas, the third and final point didn’t quite come off. A lofty ambition, but unrealised. If ever that was realised, one might have to make a song and dance about it. The run up the Christmas Festivities, has been damp, deluge after deluge, diabolical if such a strong word could be used as adjective for the weather. Already demoralised, this has not helped. I am yet to go wander down to the plot. I may well need super strength wellingtons. Though the ones that I have, will have to suffice. In the next few days, that will certainly be an endeavour. There is most definitely some plot withdrawal symptoms setting in. One must remain positive. All the tellers of the world, suggest that the misplace jet stream was in fact a freak, anomalous occurrence. No solace, in being a first year allotmenteer, but the key there is anomalous. It happens, from time to time. In addition, there a eight raspberry canes and a blackberry to be sunk. The latter is driving Mama H potty in having resided on her kitchen sill for far longer than she would like. I must remember to ask her to make paper pots. One has acquired the wooden contraption to manufacture them. The purpose of such an exercise? To sow seeds, and propagate on the window sills of the classroom next to the cacti. The cacti, that you see below, would be their neighbours. You will have seen how Pops and I have managed to get some horse poop. This won’t fill all the beds, oh, how I was hoping! No, it won’t. It is a start. I will have get some more at a later point. There is off course the builders bags of leave mold. I am rather proud of that! That is the value of taking advice, of learning, Things start to fall into place, and generally for a reason. So those bags can be used to some extent, to fill the raised beds. Above, are the classroom cacti. Most of which, are rescued from a garden centre. Each one was named by my students, some of the names are from textbooks, some are named after students! 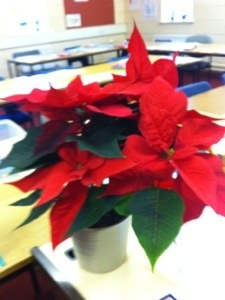 They add a bit of colour to the classroom, beyond the green, the flowers are what we all eagerly anticipate. Quite a collection, has been amassed. I can honestly say, that I am not really a fan of the spiky ones. The ones you see here, with the Santa hats. Not sure how long they will reside in the classroom. The removal of the hat, requires the stick that runs straight through the cactus to be pulled out. So that, and the propensity of the cactus to bit you, my well be the death knell. Only time will tell. 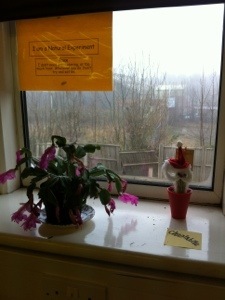 Think I will avoided more cacti in the classroom. As mentioned above, I would like to sow some chillies, tomatoes, peppers perhaps on the window sills. That means rummaging in the seed stasher! Having found out where the local stables where, I asked pops if he would help in getting some poop to put in the raised beds. The stable is very local, a few minutes down the road; it is home to 18 ponies and horses that for one reason or another their former owners couldn’t cope with. When we went this morning, there were already riding lessons happening for the local children. I had been advised of this place only this week; and looking at the plot, felt I had to make a start on filling the raised beds. There are 12 raised beds, and these will need filling if they are to made use of. Today, pops and I filled 12 rubble bags mostly full of rotted down horse manure. This is manure that is trusted; it has been there for many many years, and the ‘lotment neighbours have used it for many years. Compared to a retail prices, where one bag would cost approximately £5, this was a bargain! Pops actually did all the hard work, I must say that there was a technique to his digging. Don’t worry, pops has been brewed a cuppa as part reward, the rest would be to actually grow stuff. He hurts, and so do I! I have long wanted my own teaching space; and having acquired one, wanted to ensure it has some Greenary in it. Adorning my window sills are Cactii. Christmas Cactii to be exact. Most of them, and there are 13, are what I term rescue cactii. Rescue in that at the beginning of term-September-I espied them in a local DIY store, looking a bit miserable, sorry for themselves and reduced to something like a pound each. I thought why not, these are cactii, they don’t need to be pampered. They should be okay. Besides, they flower; they could look pretty ugly in the right sort of way. For a number of weeks, they sat happy and a few of them in fact flower. I think in total, three have flowered. Red and pink so far. And they have been stunning. The students have grown attached to them. In the picture above you see Bruce. Ain’t be pretty? The cactii were allocated name by my 60 students. Each put a name on a ballot. They were drawn from a hat with random allocation. As indicated before, a few have flowered. With only a few more weeks left, I do wonder about the rest! Here’s hoping. And! One last thing. The ponsietta. I normally have flowers on my desk. Once small bunch over a fortnight. The horror today, when they weren’t there! It took a whole for the bright red plant to register. “That’s not reall!” Were the cries from the classes. It is, and hopefully it will stay real. The premise being to keep it past Christmas. This year, there were high hopes for the aubergine analogue study. Why? Because of this guy. Okay, admittedly, I grew him outside, and did temporarily have a plastic greenhouse over him and Claude the astia Courgette. Alas, the wind took it and it was goodbye greenhouse. At one stage, there was a plastic bag covering him as a cloche. There are many naysyers with aubergines, and to be fair, I can see why. These are fickle, fanciful creatures. If they do not like the conditions, noses are turned up and little feet are stamped. The aim of the aubergine analogue study was to learn from the kevin mistakes. Not sure if I will try again! Six foot tall, triffids are terrible tyrants. Perhaps that is an exaggeration. Armed with a packet of seeds, last year I tried to investigate just what makes triffids tick. So Gladys the Butternut came into being. At that time, last summer, space really was at a premium in Dad’s back yard. Gladys was grown up, rather than out.Seemed a good idea at time, And boy, did she grow. All seemed well, there were flowers.I think all in all, five blooms arrived. I may have used a couple to play with Bruno actually. There were fruits, but these were fruits that were simply not working. A failure to pollinate the most likely reason. There were prior to this, many many male flowers, the girls took their time arriving. I do think I will try again. Just need to consult my notes this time! Last year, the one true result, had to be Bruno the Ghost rider Pumpkin. Mama H took pity on a £1.50 seedling whilst we were visiting the Garden Cafe in Kings Heath. I was dubious, at first. Pumpkins have never really hit my radar, I wouldn’t have given them much thought. So why not? Planted in a tomato grow bag-the £1 sort from poundland-the seedling was observed at close quarters in Dad’s garden. He was protected, first of all, with the bottom of a pop bottle. Cut off and used as a cloche. A good move, else slugs and bad weather would have taken Bruno before his time. He grew, grew, and grew; becoming a triffid of one sort. It was a heartening process, to see something so small, grow into a beast! By late summer last year, there were something like four babies. I couldn’t quite decide what to do with the fruits. There was no knowing, would one take off; would all four? Well one did. 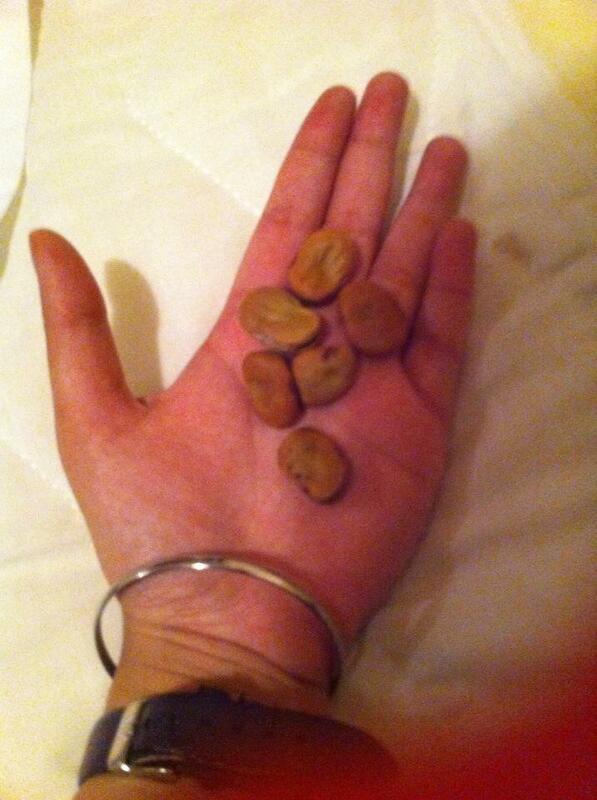 Precious and therefore pampered, the one fruit did come off. About six weeks before Hallowe’en, the fruit was taken off the vine. Dad reckoned that if it wasn’t removed, it would probably go bad. Taken off, it was left to ripen on the window sill. Then what happened? Well, Ma curried it.